Summertime sanctity. Holiness and hamburgers. "Always preach the Gospel," Francis of Assisi said to his followers, "Use words when you have to." WelI, what do you use the rest of the time? ACTIONS. "Whoever welcomes you welcomes me." Whoever gives a cup of cold water to one of these lowly ones because he is a disciple will not want for his reward." A picnic table is a pulpit with paper plates. "For the young child the mother is God." (Arab Proverb). Treasure the opportunities for mothering and fathering, and sandwiching that Summer brings. To everyone: What you pray about in the pew, take to the park with you. For all you do, this prayers for you! The manner in which people used language to make their meaning clear in ancient Israel was closer to the vividness of Native American languages than to English. For example, in English we say "God is everywhere". Instead, in the Hebrew Scriptures we read: Sun and moon, bless the Lord; Stars of heaven, bless the Lord... Light and darkness, bless the Lord; Lightning and clouds, bless the Lord. The same vivid mental imagery lies behind our Hebrew prayer word AMEN. It does not simply mean "Yes", or "I do", or "I believe", or "Thank You". Rather, in ancient Israel, when they saw a child safe and secure in its mother or fathers arms they would say, "That is haman". Our AMEN comes from that. Our AMEN means" I am safe in Gods arms when I say This is true". As a Parish Community, we Pray...May we become the land of the living by respecting the sanctity of all human life from the first moment of conception till the final breath is drawn. On Saturday, July 6th, as on every first Saturday of each month, Exposition of the Blessed Sacrament will take place following the 8:30 am Mass until 10 am. This is our opportunity to spend a bit of time with Jesus, asking him to heal our Church and protect our country. form all harm. Our annual Fourth of July Mass will be held at 9 am on Thursday, July 4th. Let us celebrate together the freedom we share and ask God to continue to bless our nation. Mass will be followed by refreshments in front of Church. 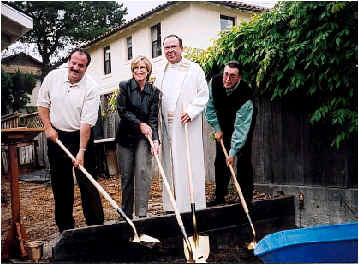 On June 1st Father Ring was joined by Mayor Franzella, Building Committee Chair Jim Ruane and Vice Principal Judy Watt for the breaking of ground for the new Education Center. In the past weeks, the old garage has been demolished, the ground has been surveyed and excavation has begun. Thank you to all who are making this possible. Thank you to all the parishioners who have donated to St. Vincent de Pauls 2nd collection every 5th Sunday throughout the year. Through your generosity St. Roberts Conference is sending 6 children to Camp Armstrong for a 12-day camping trip at a cost of $535 per child. Our Conference is also contributing $50 for 60 children to attend the "Mervyns Back-to-School Child Spree" this Summer. Each child will be individually chaperoned by one of our teen club members under the direction of Diana Landin. Thank you for your continued support to St. Vincent de Paul. The Parish Office will be closed on Thursday, July 4th.